I had no intention of posting anything else this week. Ever since Anita of A Mad Tea Party announced a poori-party, I kept toying with the idea of making some. It was after all, very tempting. However, there was only one small problem - never in my life had I made a poori before! But there was so much information on the making of pooris doing the rounds of so many blogs here during the last week that I was slowly warming up to the idea. Armed with a wealth of knowledge thanks to Indira, Anita, Bee & Nupur, I finally decided to make some pooris. Since it's my first time making these things, I had no idea how long to knead... I just kept kneading the dough till it begged for mercy.I allowed it to rest for about 30 minutes & then proceeded to make, roll & fry my pooris in hot oil. I was so thrilled with what I saw. My very first poori had puffed up so beautifully & looked really good. Beginner’s luck, huh? I did not know whether to eat it or take a picture of it. Pooris and aloo-bhaji go together so well. Making the bhaji was a breeze as this is something I make regularly for masala dosas. 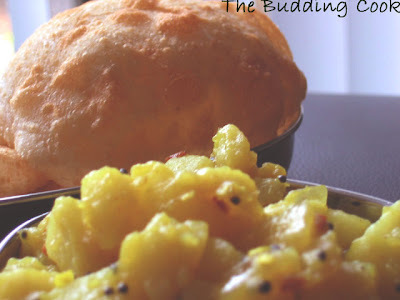 Here’s how I made aloo-bhaji. Add the onions followed by the green chillies, ginger and the powders. Sauté till the onions are transparent. Add the cubes of the boiled potatoes and about half a cup of water. I am off to join Anita’s party now! Yay! That HARDLY looks like the effort of a first timer and your aaloo bhaji is almost the same as mine...was that a tamil recipe too? My first time in your blog and i shall be around often to check out your beautiful stuff! Oh WOW!! lovely pooris! first time? they look perfect! So glad you could come, TBC! Wonderful pooris, and from a Budding Cook! See, how easy it really was?! And what is this about "healthy eating be damned?" Poori-bhaji is very very healthy! ;-) Whole wheat flour, and boiled potatoes! And all those endorphis that started their whirl within our body just at the thought of it, and the getting together with friends at the party - all very very healthy! Bon apetit! another one bites the dust. that poori looks perfect. Hi came to know there is a poori party from you dear! Poori and aloo subzi are one of the best combinations! Nice mouth watering recipes. Could you tell me what flour (exactly) you used. Wow! Great looking Pooris and Bhaji TBC and that too at your first attempt. I remember too that I've never had trouble with pooris. Of course I'd have the occassional flat ones but mostly they puffed up okay. Chapathis though, it took me several attempts, variations to get them decently soft. Great looking pooris for a first timer...!! I agree, TBC is beginning to look a complete misnomer! Look, you made someone real happy,and they are asking for more! :-D And you said not-healthy?! I don't know whether it is a tamil recipe but this was the way my mom always made it:-).Mom's always have the best recipes, don't they? Thanks for stopping by & do come back when you get a chance. Manasi,thanks. You can't go wrong when you follow the recipes of such great cooks/bloggers. Lucky you, my hubby has completely given up on me now:-( I keep meaning to do something but that day never comes! How could I not when you are the hostess?I cannot wait to see the others too. There are a couple of first-timers like me. Bee, yeah, I caved!& thank you. BTW, I read your cluri story a couple of times & showed it to my hubby too.We enjoyed it so much! thank you:-) Why don't you join us? Thank you so much. You really make me feel so good. Seec, thank you.All Purpose Flour. I've never made chapatis either..maybe that shd be next for me! Coffee, thanks! I am actually very pleased with myself;-). I liked yours a lot too... esp with the step-by-step description in pics. Yeah, or so I'm being told..
Oh yum! I have never made this, but what a delicious looking recipe! Poori Bhaji looks delicious with that raita!...Great to see u at Mad tea party! all the bloggers are going crazy on pooris. it is raining pooris every where:) very beautiful pics. aloo is my favorite with poori. They are just perfect. So tempting puffed up puris. Are youb sure you haven't made puris before?...those look perfect!!! 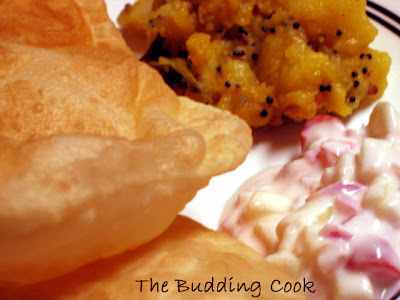 puris look lovely, so does the bhaji! Kristen, thank you:-) It's basically fried bread. Padma, thank you!.I am just waiting for Anita's round-up. 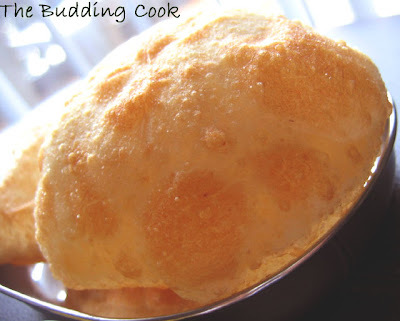 one happy puffed up poori's,its been raining poori's all over in the blogsphere. Picture perfect, drool inducing goodness in that platter! poori celebration everywhere and cant wait to eat it ... pls someone send it to my house!!!!! I love pooris. Just adore them. Can't make them -- eat them out or wait for my mom to make them. Yours look fabulous. Lovely looking poori's. Too good to believe for a first timer. Well done. For the first time, these look the pooris of a pro. Way to go girl! Looking at those pooris, you still call yourself a budding cook?? amazing recipes and equally amazing pics.... thanx for all ur comments tbc...:) i havent registered with food blog desam... how should i do that??? kindly suggest... i cudnt get time to update my blog for some days now.....back now... temme how can i register therE??? r u registered there too?? Raaga, Thanks:-) I was pretty pleased with myself too. Thanks for saying that.Very nice of you. Shubha- I'll see on your blog. *First* time's the charm for you! How wonderful! Thanks for the lovely inspiration. Dear, you are most welcome to send a recipe of your choice! didnot get your mail. please do send again. reg janmastami mail - no problem, if you leave a comment with link to your post, its more than enuff, we'll pick up details :). thanks.